This year, Zloty Tur, the favorite world professionals’ challenge, will take place in an unusual format that will combine the classic tournament and armfight matches Vendetta All Stars, which will bring together the strongest athletes from around the world. "The circumstances in the armwrestling world are very good for us, and it's a sin not to use it to make a good show," says Igor Mazurenko, Professional Armwrestling League president. "Therefore, we decided to hold a series of armfights in the days of the Zloty Tour. All armfights will be held in the right hand, so that if participants wish, they can compete on the left, and pullers, who will participate in the World Cup on the right hand, have additional chances to get the titles! Who do we want to see on the Zloty Tur this year? Everybody! We will be glad to see champions who have repeatedly proved their strength, and young talents who want to gain experience in the professional armwrestling and show their prospects. We are ready to provide maximum support in processing all necessary documents and applications. Who exactly will we not see on this Zloty Tur? In the process of preparing and selecting participants for armfighting, we communicated a lot with Denis Tsyplenkov. Unfortunately, we are unlikely to see his fight on the Zloty Tur, since Denis's training was purposeful and depended on his opponent, and it's not so long for Denis to regroup on the style of the fight to the classic. Potential rival of Denis - Devon Larratt - also will not visit the Zloty Tur". - Michael Todd (USA) against Andrey Pushkar (UA). After the Zloty Tur and a series of fights Vendetta All Stars on November 20-21 on the same stage will host the World Cup for athletes with disabilities. 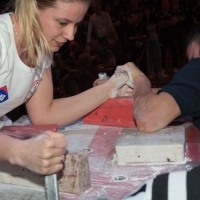 The Cup is organized under the auspices of the World Armwrestling Federation, with the same rules, system and classification used at the World and European championships. More information about the Zloty Tur and registration form can be found on the website of the event and in the informational package. Evgeniy Prudnik: "My time will come!"